Pictures The Gambia, September 2002. Pictures taken during our vacation, September 2002 in The Gambia, West Africa. The characteristic Baobab tree and various animals. Banjul - The capital city. We saw no tourists the first time we went. Kololi - More than just a tourist trap and fun once you resist the locals' harassment. Serekunda - You're lucky pictures don't capture the smell. Abdou's ("Kleintje") Drum Factory in Manjai Kunda. The African Queen bar where Abou's band plays (Kololi). Frans joins in (82 KB). Frans joins in (88 KB). 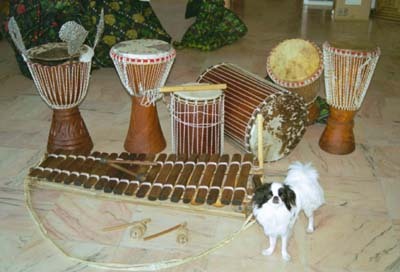 Various bands in the Tafbel Hotel (Kololi). Band with kora (58 KB). Band with balofon (78 KB).